Last week, a MedSafe Drug Drop-off box became available in Liberal, Kansas. A ribbon cutting ceremony hosted by the Liberal Chamber of Commerce took place for the MedSafe box, and officials with the Liberal Area Coalition for Families, including director Sarah Foreman, were on hand for the presentation. The box came at the heels of a purchase of a Elastec Drug Terminator Incinerator. The purchase was made possible with a donation from Southern Pioneer Electric’s Helping Us Give to Society (HUGS) program. The $1,500 HUGS donation was matched by CoBank, making a total of $3,000 towards the LPD’s equipment. 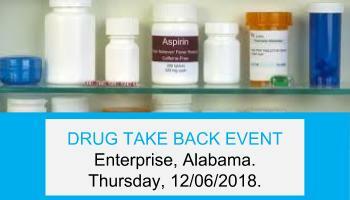 Annually, the federal Drug Enforcement Administration (DEA) has its National Prescription Drug Take Back Initiative. The Liberal Police Department takes part in this. Now, with the additon of the MedSafe box, people can dispose of their unwanted medication whenever it’s convenient for them. It’s available for drop-off Monday through Friday, from 8 to 5. The MedSafe box is in the lobby. There is no need to check in with anyone. You just walk in to the station, throw in your medication, and leave. After the medications are dropped in the MedSafe container, a minimum of two employees remove the medication and take it to the new incinerator. The medication is incinerated on the same day. The Vermont State Police is also joining the ranks of departments that have a secure disposal box available year-round, all week. Six of the 10 VSP barracks already have been outfitted with drop boxes. There are more coming. It’s just another way for locals to clean out the poison from their medicine cabinets, said Public Safety Comissioner Anderson. Police stations and State Police barracks across Erie County now have drug take-back boxes. People in Erie can also safely deposit expired or unwanted prescription and over-the-counter medication at Erie Police Stations now. An interactive map that shows where the boxes are located can be found here. It was created by the Pennsylvania Department of Drug and Alcohol Programs and includes more than a dozen sites in Erie County and nearly 700 statewide. At the ribbon cutting ceremony in Liberal, Kansas, Liberal Area Coalition for Families Director Sarah Foreman spoke about the goals and expectations for the MedSafe box the Station installed. She said a large problem, at least among young people, is taking prescription medicines from their parents’ medicine cabinets to parties. This creates a danger close in nature to taking illegal drugs. Maybe more dangerous, since the pills are mixed and may be funky due to the expired ingredients. While having a disposal box doesn’t empirically curb the behavior, she hopes that reducing drug use among teenagers would be one result of installing the drop box. “I think the goal of any MedSafe disposal is to get either prescribed drugs off the streets, out of the wrong hands, and expired medication also not in the water system, not on the streets, not in dumpsters, but safely disposed of and then incinerated,” she said. Other dangers of expired and unused medication would be for small children, as well as elderly who may be confused about which type of medication is safe. Often people don’t know what to do with the expired medications, or don’t get to the drop off locations at drug takeback events, so having a permanent box that is open all week is a great option for disposing of expired or unused medications. From 8:30 a.m.- 2:00 p.m.
On October 26, 2017, President Trump announced that his Administration was declaring the opioid crisis a national Public Health Emergency under federal law, effective immediately. “I am directing all executive agencies to use every appropriate emergency authority to fight the opioid crisis,” the President said. Declaring the Opioid Crisis a national Public Health Emergency legally authorizes federal, state, tribal, and local authorities to allocate existing personnel and resources toward opioid prevention efforts. Innovation costs money. All the organizations and government, pharma, and medicine that are working to stem the flow of the opioid crisis need money to put their ideas into practice, so directing funds to all the people working to solve the opioid crisis is going to be a primary concern. Where exactly is the money going to be spent? Each agency has their own list of needs. Some of the money is to be used for creating more access to addiction treatments, as many patients with opioid addictions simply cannot afford the detox and addiction treatments currently available. Another costly way to reduce opioid death is furnishing emergency personnel with naloxone, which is the primary treatment for opioid overdose. Naloxone is costly. The government can force Pharma to slash prices. We’re still working on that- it hasn’t happened yet. First of all, going after the bad guys who are importing opioids in an unregulated manner. To this end, Trump signed the INTERDICT Act in January, 2018. This law directs the Department of Homeland Security to provide additional tools and resources to detect and intercept the supply of illicit fentanyl. Trump spoke about handing out the Death Penalty to drug dealers. He also is still emphatic about strengthening the wall between the U.S. and Mexico, which supplies a lot of the US’s illicit drugs. Regulation also includes the FDA’s efforts to create better guidelines, reporting systems, and a way to regulate the prescribed opioids in the U.S. Patients requiring certain medications containing opioids are already having a more difficult time getting their prescription refilled, and they are not happy. They are forming groups and creating petitions for medical opioids that will not interfere or limit the patient’s medical treatments. Many addictions start without the knowledge of the person developing the addiction, or without the knowledge of people around them that could have prevented or assisted with the addiction. Explaining the effects of drugs to teenagers is always appropriate. Giving patients good information about their prescribed medication, and creating a list of alternative ways to treat, control and handle pain is another way to reduce opioid addiction numbers. Proper disposal of opioids is a very big step toward decreasing the numbers of opioid addiction and death, and it is something everyone can do. Follow us for more information on the latest innovations, solutions, and news about the opioid crisis. State Senator Patty Ritchie and Oswego Health are offering a community event where people can safely dispose of their unused and unwanted medications, including prescription and narcotic medicines. The event will be held from 2pm – 4pm, Thursday, Decemebr 13th, in the lobby of Oswego Hospital at 110 W 6th St., Oswego NY 13126. Law enforcement officials and Oswego Health pharmacy staff will be present to assist community members and to answer questions. From 2:00 p.m.- 4:00 p.m. The Enterprise Police Department will be conducting a prescription drug take back event on Thursday Dec. 6, 2018, at Enterprise City Hall, for safe disposal of unused or expired prescription medications. From 9 a.m. to 4 p.m., area residents are encouraged to bring any unneeded prescription medication to the Enterprise Police Department in City Hall, where it will be bagged and collected for disposal by the Drug Enforcement Agency. There will be a table will be set up inside the front doors of City Hall on Thursday, where officers will collect any unwanted or expired prescription drugs. From 9:00 a.m.- 4:00 p.m. The Indiana Attorney General’s Office will accept your old, unused prescriptions in Lawrenceburg, Indiana on Wednesday, December 5th 2018.